This exchange caught my attention for its rarity. It felt like a blast from the past. There was a time when it seemed David Cameron couldn’t answer any question without some mention of the ‘big society’. Not so lately. Today we have an open letter to the Prime Minister from Stephen Bubb, Chief Executive of ACEVO, saying that movement towards charities playing a bigger role in the delivery of public services has been ‘glacially slow’ and that the big society agenda now appears to be ‘going nowhere’. I’ve written on this blog before and in more depth about the big society’s absence from government policy. But I was prompted to return to the issue again lately, when writing a book review for the academic journal Cultural and Social History. The book I was reviewing was called ‘The Big Society Debate: A New Agenda for Social Welfare?’, edited by the Cambridge historian Simon Szreter and the LSE expert on international civil society Armine Ishkanian. I won’t repeat my review here, nor that of my earlier review of Hilton and McKay’s book on the same topic. Both are good if rather different books, but both leave me with a nagging worry: have they missed the window? The time it takes for an academic book to be planned, win a contract, be written an edited, submitted and peer-reviewed, revised and finally published is a real issue. It means we must think carefully about whether a book is the right format for responding to current or topical debates. The weight of the material that can be included in an edited volume is appealing, but that does not mean it is necessarily the appropriate medium. Talking about the big society now sounds like an echo. When he was in opposition, there was always the chance that the rhetoric might lead to something genuinely new. That a cash-strapped government might want to draw upon mutualist traditions to seize the mantel of public sector reform, and might find innovative ways to encourage voluntary action as part of the government phase of the mission to detoxify the Tory brand. Now we know that under Cameron the reform agenda is facing a rather different direction, while the Liberal Democrats have no interest in using this as a way to rein in their Coalition partners. 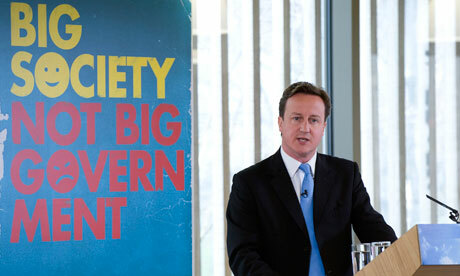 The big society agenda is simply not a major feature of David Cameron’s government. Those academics who have invested time in such projects can only hope the Prime Minister revives this particular soundbite in the run-up to the next election. However, a little perspective here. The frustration of academics is nothing compared to that felt today by those working in the voluntary sector. This entry was posted in Forum, George Campbell Gosling, Politics and tagged big society, David Cameron, Labour. Bookmark the permalink. I’m sure historians will roll their eyes at the claim to have established “the world’s first social investment institution”. However, what speaks to me loudest here is an omission. It is an omission that seemed to go unnoticed in the media discussions yesterday, including the debate with Bubb and Philip Blonde on Sky News. It is quite simply the striking omission of any civic participation, charity or mutual ownership dimension to the major public sector reforms that have been put into practice by the Coalition government. In the Sky News debate Bubb said the government had gone slow on public sector reform. I would say the opposite is true. In areas including health and education, the government has gone way beyond what was promised by either party in opposition. It is simply that they have gone in a different direction and the voluntary sector has been left out of the picture, as I have argued on this blog before. Great post, George, and thanks for raising some very important issues about the nature of academic publishing, specifically with regard to books and the impact historians can have. I am one of the contributors to the Ishkanian and Szreter volume that George refers to here. I was a latecomer to that book project, but the activities of various academics involved in that volume and the Hilton et al one got into gear with the election of 2010, even before. The Ages of Voluntarism workshop took place in May 2009, whilst the History and Policy seminar at the Cabinet Office was held in June 2010; the LSE conference and the panel at the Economic History Society that also fed into the Ishkanian and Szreter book were held in later 2010 and early 2011. The production of the Ishkanian and Szreter book was incredibly fast for an edited collection, but it still came out around the time Steve Hilton was packing his bags for the US. As all this should show, historians are more than capable of making timely contributions to public debates, but these need to be in other formats – blog posts, op-eds, media consultations, direct engagement with the policy-making community. Learned societies have a vital role to play in co-ordinating rapid yet rigorous response to policies, and an examples of this that historians should consider include the Social Policy Association’s In Defence of Welfare, an edited collection which was made freely available online: http://www.social-policy.org.uk/downloads/idow.pdf History and Policy are one group who are convening similar activities, but there are many other conversations that need to be had: in our case, between academics and voluntary action organisations. Conventionally-published edited volumes addressing current policy will always run the risk of that policy coming to an abrupt end during their lifecycle, but I think that their ultimate contribution comes with the longer term attempts to understand and evaluate policy, be that by policy-makers, practitioners, academics or the interested public. As has come out in work I have done with practitioners in less historical projects, the ability of academics to look at something from a perspective other than that of day-to-day service provision and to take that longer view is important and valued. And I couldn’t agree more on the point about charities being under pressure. Very interesting and timely post, George. The concept of Big Society has always been very vague. While I agree that the Government has all but given up on the Big Society slogan, arguably the ideology behind it is still alive and kicking. If ‘Big Society’ contrasts with ‘Big State’ and represents withdrawal of statutory funding for public services and the responsibilisation of citizens, there are many indications that the direction of travel has not changed. The policy of contracting out public services – whether it be the Work Programme, probation services or social care – is accelerating. This doesn’t equate to ‘encouraging voluntary action’ – most of these contracts will be awarded to the very largest voluntary and private sector organisations – and raises important questions about the implications for the wider voluntary sector as grant funding dries up.